River Plate and Boca Juniors have had identical Copa Libertadores 2018 campaigns: six wins, five draws and one defeat. However, their paths toward the biggest clash in South American soccer history couldn't have been more different, almost as contrasting as each club's identity and playing style. 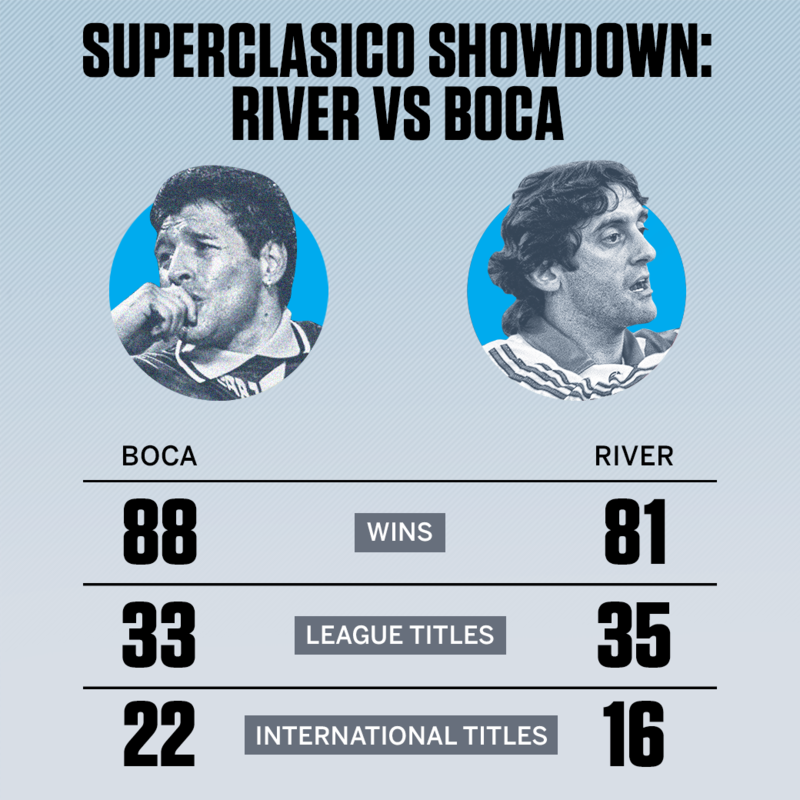 Derbies and rivalries exist in every footballing nation, but Boca vs. River, Argentina's Superclasico, is just a different proposition altogether. Neighbors in the docklands of Buenos Aires in the early 1900s, Boca have come to represent the working class and "the people," while River, who moved base to the more affluent suburbs in 1922, are nicknamed Los Millionarios and have become the team of the upper class. Whether those labels are completely accurate is a different story. Boca and River first met in an official fixture in 1913 and have played out 246 more contests over all competitions since; Boca winning 88, River 81, and the two sides drawing 77 times. Passion and hatred have become globally synonymous with the rivalry, and ahead of the first matchup between the two in the final of South America's biggest competition, the Copa Libertadores, Argentina and the football world at large are at a fever pitch. The two have reached this year's final in very different ways. While River showed their best in the round of 16 and the quarterfinals against Racing Club and Independiente, Boca only reached top form in the semifinals against Palmeiras. Marcelo Gallardo's River enjoyed a pleasing group stage, registering impressive wins and avoiding any setbacks, while Guillermo Barros Schelotto's squad only qualified for the round of 16 thanks to Palmeiras' victory against Colombian side Atletico Junior, a result Palmeiras would soon wind up regretting. If Gallardo has achieved something during the four-and-a-half years he has been boss at River, it's the fact that he has supplied the group with a competitive edge. That competitive spirit is the biggest strength the Millonarios possess heading into this final. The strong mindset that both starters and substitutes own is as hard as steel, and seems to get even stronger when things get complicated. Gallardo's leadership is unquestionable during the most successful era of the club's 117-year history. River know how to play a match against Boca and, perhaps, here is where their secret lies. They know how to hurt them and how to pick the right time to make their moves. Crucially, they also know how to play in the Bombonera, home to the first leg of the Copa Libertadores. River have won a couple of times there in local competitions, and they haven't lost in either of the international series under Gallardo (including the infamous "pepper spray match" in 2015). Conversely, Boca rely on their individuals. And even those qualities that might seem a collective virtue always originate from the specific skill of one of their players. In the matches against Palmeiras, their collective strength and ability to control a very dangerous rival were worthy of praise. That strength came from Carlos Izquierdoz and Wilmar Barrios. The central defender has become a building block thanks to his personality and efficiency to win one-on-one challenges and aerial plays, while the importance of the Colombian midfielder Barrios is a well-known fact. Pablo Perez, meanwhile, runs the offensive game. While it is true that the more obvious quality of the former Newell's player is his strong personality, his contribution is more valuable when he has the ball at his feet. Nahitan Nandez has slotted in by his side, providing a distinctive style for his position, a trademark of both Uruguayan football and whoever dons a Boca shirt: a lot of guts, energy and someone always at the service of his team. In attack, Ramon Abila and Sebastian Villa add a strong attacking game, the former fighting his way on the inside, the latter with his speed on the outside. Besides their attitude, River enjoy experience and youth in perfect balance. Jonatan Maidana (33) and Javier Pinola (35) form a reliable defensive duo. Leonardo Ponzio's absence in the first leg will be painful, since the veteran captain is a pressure specialist and a key player in terms of River's first pass. Then there is Exequiel Palacios, who has excelled during this semester both in getting the ball back and finishing plays, and whose contribution is essential for Gallardo's Superclasico plan to work. Up front, Rafael Santos Borre has brought a youthfulness to the side and helped renew the energy of the whole team. Boca, on the other hand, have been criticized for their approach in matches of this caliber, but in the Copa Libertadores they have been consistent at the Bombonera and have played with character away from home. In fact, they haven't lost a game in the elimination rounds while knocking out opponents such as Cruzeiro and Palmeiras. Add in that over the last month Barros Schelotto has finally found his starting XI, an elusive pursuit, and Boca are peaking at the right time. The path of the Copa Libertadores is long and winding, and River and Boca got to the finish line via different routes. And still, it is very hard to say that either of the two teams hold an edge ahead of the final. That said, it is worth pointing out two men who are capable -- because of their track record and current form -- of tilting the balance one way or the other. They are Gonzalo "Pity" Martinez and Dario Benedetto. The hopes and dreams of millions of fans rest on their shoulders. River's No. 10 Martinez is coming off an injury and was unable to complete one of this week's training sessions, but if there is someone capable of spoiling Boca's party, it's him. Lately, there haven't been many River Plate players stepping up in Superclasicos. Quite the contrary. That's why his cool head and hot blood are a blessing for head coach Gallardo. Martinez has already scored in this year's Supercopa and also in the last two games against Boca at the Bombonera. He is a player who enjoys these high-profile and high-intensity clashes. For Boca Juniors, Benedetto's contribution is different. He has yet to deliver a superb performance against River Plate, but he has already passed every other test. He has been his team's top scorer the last few seasons, and came back in full swing against Palmeiras from the injury that left him out of the World Cup and the early rounds of the Copa Libertadores. He scored three of Boca's four goals in the semifinals of the Libertadores, leaving his mark in both of those fixtures. His second, at the Bombonera, was a masterpiece, and the one he scored in Sao Paulo secured Boca's progression to the final. He is there when it matters. One yard and one split second is all Benedetto needs. In moments like these, words only get in the way. River and Boca know each other by heart. Both teams have what it takes to win this final and make history. The only thing left to do now is to sit back and enjoy 180 unforgettable minutes.